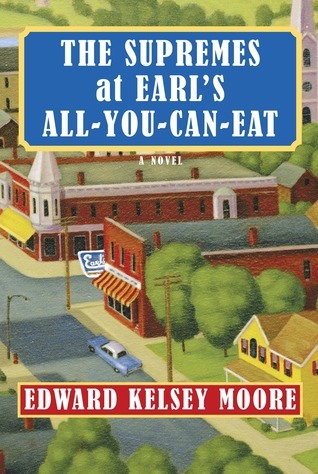 The May selection for the Augusta Library Book Club was The Supremes at Earl's All-You-Can-Eat by Edward Kelsey Moore. While a few members thought the book was hard to follow, the general consensus was that it was well worth making the effort. They particularly enjoyed the characters and the frequent comical situations into which the characters are plunged. (Two highlights include a spectacularly botched wedding and the fiasco that results when a newly reformed stripper gives a little too much detail about her sins at a Revival Meeting.) These and other scenes are so vividly written that Book Club members had a great time sharing and laughing about them. The book also brought up an interesting discussion about the role of race in both the fictional world of the book and the real world of the readers. There was a thought-provoking debate about whether the author would have been accused of racism had he been white since many of the characters, almost all of whom are African-American, are heavily flawed. Most of the members felt, though, that Moore was using character flaws that are by no means specific to race, and that those flaws made the characters more believable and the story more interesting. The Supremes at Earl's All-You-Can-Eat also generated an intense discussion of the roles of women as portrayed in the book, how these roles have changed over the years, why many of the book's women related to men as they did, and how the friendship between the three main protagonists affected their thoughts and actions. The next Book Club meeting will take place in on June 11 at 6:30 p.m. in the library; the members will be discussing Dear Life by Alice Munro. Copies have already been ordered for current members, but the Book Club always welcomes new members. If you haven't previously been to a meeting but would like to participate in the next one, you can either request the book through the MORE website or contact the Augusta Public Library for help in requesting it. As always, Book Club meetings are free and open to the public.